The recent wave of science fiction movies is more personal than ever. Though it has long been one of the leading genres in escapism, sci-fi has succeeded in depicting alternate realities that inherently shed light on our own. The Day The Earth Stood Still (1951) functioned as a Cold War allegory, using an imposing humanoid to discourage nuclear proliferation, while Close Encounters of the Third Kind countered earthly jingoism for intergalactic dialogue. Tales like these are outliers, however, compared to the army of bombastic movies that have set their narratives to stun and relied on explosions over emotions. In recent years, we've seen Hollywood embrace a more cerebral strain of sci-fi that explores near-future possibilities and grounds them in a single character's wide-eyed experience of them. Denis Villeneuve (Sicario) is the latest director to use the sci-fi genre as a mechanism to tell a fundamentally human story, and Arrival is perhaps the most intimate film of its kind. Though a thought-provoking and moving film in its own right, Arrival is perhaps better appreciated when viewed alongside its recent predecessors: Gravity, Interstellar and The Martian. Each of these titles foregoes the temptation of exploiting futuristic technology by showcasing the most enduring hardware of all: the human heart. 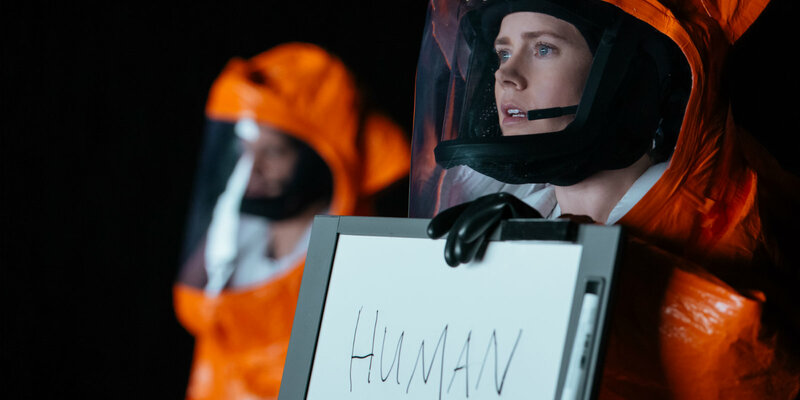 At its core, Arrival is a movie about communication and language, the very fabric of our earthly existence. Since the proverbial Tower of Babel and the exodus that followed, the world has been largely divided by verbal barriers. Cultures cling to their native tongues and modes of expression, enhancing their own society while distancing themselves from others. When the twelve Heptapods land across our planet in Arrival, they seem to present a clear and present danger. As Louise (Amy Adams) and Ian (Jeremy Renner) discover, however, the obsidian monoliths aren’t the real threat. Feared by citizens across the globe, these foreign ships and their squid-like inhabitants reveal the more significant and existential crisis: our world’s inability to communicate with one another across borders, cultures and languages. Enter Louise, the world-class linguist who uses visual aids to understand the foghorn sounds and inky calligraphy of the two aliens, who are affectionately dubbed Abbott and Costello. By efficiently cracking the enigma code of the “arrived,” Louise proves that cross-continental (and yes, interstellar) communication is possible. This has two profound effects: first, it gives Louise the ability to see time in a revolutionary way; second, it reveals the reactionary leaders around the globe to be contributors to our stunted international discourse. If Louise can earn the trust of a four-story-tall grunting jellyfish while our government intelligence can’t communicate with one another, then our culture clearly has room for improvement. This is what makes Louise the unwitting hero. She single-handedly diffuses the international crisis by communicating directly with General Shang (Tzi Ma) of China, using a mélange of fact and emotion to keep him from militarily engaging the Heptapods. Indeed, the difference between survival and extinction in Denis Villeneuve’s Arrival is a long-distance phone call between an ordinary citizen and a world leader. Between Edge of Tomorrow, Interstellar and Arrival, time has become a vehicle for new narrative developments. It’s not just a race against the clock, but a complete deconstruction of temporal understanding as we know it. In Doug Liman’s sci-fi thriller, Edge of Tomorrow, Cage (Tom Cruise) finds himself thrust onto the frontlines of a D-Day invasion against the warring Mimics. Utterly unprepared for the battle, Cage gets neutralized quickly... but not before inheriting an unexpected gift. Doused in an “Alpha” Mimic’s viscous blood, Cage gets an extended lease on life: the ability to regenerate and continue engaging the enemy. This irrevocably alters his perspective on time, as he becomes a gatekeeper to the hours and minutes at his disposal. Arrival hinges on a similar conceit, where Louise’s understanding of the aliens’ language shatters her human concept of time. The closer she gets to decoding their discourse, the more she seemingly hallucinates across multiple timelines and memories. This is the Sapir-Whorf hypothesis played out in full, where an individual’s immersion into a new language ineffably alters their perception of time and reality. Louise's new mode of communication transcends herearthly understanding of the past, present and future tenses, merging all three into an omnipresence that seemingly allows her to experience her entire existence in one solitary moment. Time, therefore, becomes the ultimate language, one unbound by borders and galaxies. As fascinating as this reveal may be, however, it’s also a painful realization that forces Louise to experience the total weight of future losses in one-fell swoop. She must celebrate the knowledge and weep at its implications. This is where Arrival deals its most advanced and yet elemental blow. As humans, we know that tragedy and loss is etched in our futures, though we spend our waking hours avoiding this truth until the time comes to embrace it. Christopher Nolan’s space-odyssey, Interstellar, tackled these themes in a more direct way. Rather than steadily bracing viewers for the big reveal through flash-forwards (like in Arrival), audiences are forced to watch Cooper (Matthew McConaughey) suffer the ebb and flow of time. Whether he’s aboard the spacecraft watching transmissions of his progressively aging children, or pleading to get Murphy’s attention from inside the tesseract, Cooper experiences this voyage of time in a truly brutal way. From within that extra-dimensional prism, however, he receives total consciousness and the ability to interact and influence his past. Cooper’s power is ultimately eclipsed by his perspective, however, and just as Louise can’t prevent the fatal illness of her daughter, Cooper can’t fully reenter the past with Murphy. If Interstellar and Arrival are mere studies in mortality, what good can be extrapolated from their stories? And can these movies even be considered true entertainment, considering they drive us to dwell on the ephemeral nature of time? Indeed, these devastating narratives take us on an extraterrestrial journey for a fleeting moment before hurtling us back down to our distinctly human plight. There are some recent exceptions, of course. The Martian was a welcome diversion from the modern sci-fi trajectory - like Apollo 13, without all of the suffering. Ridley Scott’s one-man space survival story was fairly jubilant from beginning to end. For Mark Watney (Matt Damon), the adventure was more of a race against time and less a theory-based immersion into it. Alfonso Cuaron’s Gravity was a linear tale of loss with a starry backdrop, where Ryan Stone (Sandra Bullock) grapples with a personal tragedy and strives to overcome it. Not unlike the conclusion to Stanley Kubrick’s 2001: A Space Odyssey, Stone experiences a sort of metaphorical rebirth upon entering the earth’s atmosphere. The Martian and Gravity are both harrowing in their own right, yet they are celebrations of life with relatively victorious and uplifting conclusions. In contrast to Interstellar and Arrival, these films be perceived as far more enjoyable slices of escapism. Perhaps that’s the state of modern science fiction, more of a commentary on the human struggle and less a diversion from it. Yet, with each of these films, be they triumphant or tragic, a single thread serves to unite them: love. In Arrival, Louise is blessed and cursed with the ability to see time in a god-like way. She wields the knowledge of all the pains and pleasures that her future holds, but she tells us that even with that understanding, she wouldn’t change a thing. The unbearable loss of her daughter is more bearable than she had thought, and she bravely accepts the predestined vision of her life. Knowing her daughter will die and that her husband will leave her, Louise remains fueled by a love that outweighs impending loss. It’s the reason Cooper left earth, why Ryan Stone commits to survival, and why Mark Watney dares to defy the inhospitable conditions of Mars. Though she breaks the communication barrier with the aliens and gains a newfound perspective, Louise still remains governed by love, the most universal language of all. Aside from their critical acclaim, there's one other thing that Gravity, Interstellar, The Martian and Arrival all have in common: they are all box office success stories. And in an industry landscape ruled by remakes, reboots and sequels, it's remarkable (and gratifying) to see the sci-fi genre producing cerebral, original, standalone stories that are loved by highbrow critics and general audiences alike.